As always there was much excitement in the air as I arrived at Camp Lapihio for the Friday evening check in and spaghetti dinner. It was a wonderful afternoon and early evening for catching up with old friends and getting in the mood for an adventure.. Everything was going well with my training and I was brimming with confidence as the eve of the race approached with my only concern being how the weather would turn out for us. Rain. Hmmmm, not what I was hoping for as I made the drive back to the park early Saturday for the race. At least it was a warm rain in the upper 60's but my real concern was what would happen if the rain stopped. Oh well, nothing I could do about it so no need to spend anytime worrying about it. I made my last minute preparations and headed over to the start. I lined up with Amy and gave her some last minute advice and planned to stick with her for the first couple of miles before it would be time for us to go and chase our separate dreams. Things went as planned and just about the two mile mark she slowed down and sent me on ahead. The rain was not heavy, just light and steady and it was really a non issue for me at this point. Lap one went exactly as I had planned. I was feeling great, and hit my time goal of 2:17, just like I had practiced it. I was using my car for my drop bag because part of my plan to save time was to stay out of the lodge until the race was over. It is a time sucker in there with too many people to talk to and and too cozy when the going gets rough. Jenn the Aid station captain in training was there to greet me and I gabbed a bag of food to carry with me and was out in about 1 minute. The next couple of laps were just about the same with the light rain continuing and my splits close to what I wanted them to be. Everything was going well, my energy level was good, the legs had adjusted to the task at hand after the usual tiredness that kicks in around mile 25. I did feel a blister coming on my right big toe since the 2nd lap but it was just a minor irritation that I chose to ignore. I was also developing a hot spot on the left forefoot but I chose to ignore it also and hope for the best. At this point I had been hoping it would remain overcast with some drizzle all day to keep it cool but by the time I was heading out for lap 4 the sun was breaking through. As I feared the temperature rose and the humidity stayed very high. I don't think it ever got hotter than the upper 70's but with the humidity it felt stifling along the trail, especially on Turkey Creek. I tried to slow down and back off the effort hoping that I could stay close to my goal during the day and maybe pick up the effort once the sun set. My time for that lap was over 15 minutes slower than I hoped for and already I knew my fantasy goal for 21 hours was not going to happen but if I could just hold it together the 2nd half the pr was still likely. I did get a new 50 mile pr of 10:02. It may seem odd to break a 50 mile pr in a 100 miler but my previous best was halfway in the 2007 Rocky Raccoon 100. 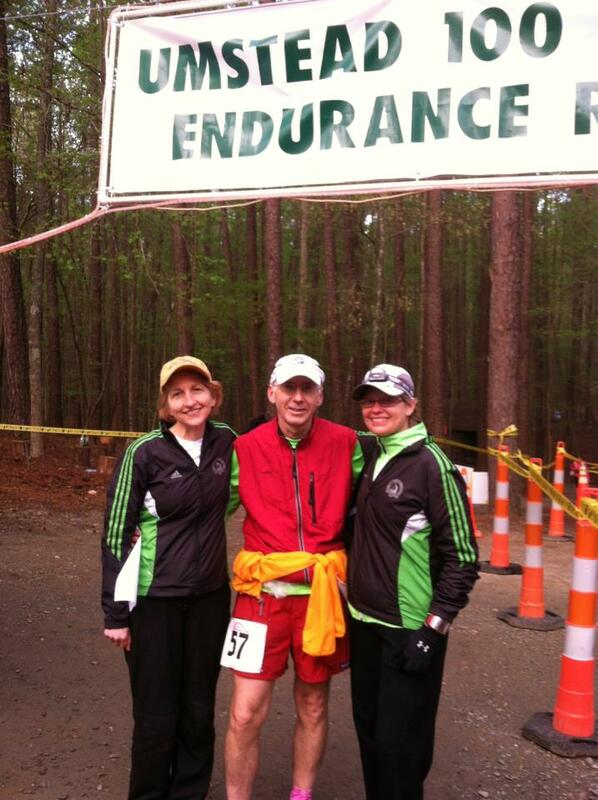 Although I have done quite a few 50 milers , they have all been on tough courses or under tough conditions. Maybe someday I can find a fast course and a cool day combined. So anyway, back to this race. I had made the decision to allow myself some pacers for the first time and about a week before my buddy Jerry Paul called and asked if he could come run a lap with me. We haven't had a chance to run together in a couple of years so I was happy to have him come join me for lap 5. As we started out I was still feeling ok and hoping to run well but it still felt awful out there. I was moving along well but as we approached the Turkey Creek aid station I could feel the wheels coming off. I took a few minutes to try and gather myself and get in fluids and some calories but nothing seemed to be helping. I was doing some suffering on North Turkey Creek and my nemesis , the spasming diaphragm kicked in full force making my life miserable. I assured Jerry that I was not dying despite all the noises, the struggling breathing and all the moaning and groaning. By now I was really not having much fun and if I couldn't get this turned around soon dropping out was beginning to sound like a really good idea. One great thing about this race are the many wonderful volunteers and I am lucky to know so many of them through my connections with this race, the ultrarunning community and the NCRC. Every time through the aid stations I had people looking out for me and lots of cheering. Also due to the out and back spur and the return trip on Reedy Creek Road from Graylin to the Camp, you get to see so many of the other competitors many times through out the day. Lots of support out there and it was especially nice for me to see several of my friends that were either running their first 100 or seeking redemption from dnf's last year. Of course my training partner and dear friend and Angel, Amy was the one I was most concerned with. I feel partly responsible for getting her into this stuff and I was thinking of her quite often throughout the day and even in my current misery on lap 5. I had seen her several times on the spur and she was looking good and moving well in good spirits. This time though as I was I nearing the turn back to camp she was not looking too happy. I stopped long enough to give her a hug as she told me about having major blister issues and having to spend a long time in the lodge having them tended. I felt bad for her but tried to give her some encouragement to continue and then I ran on back towards camp. My time for that lap was way too slow and now it would take a miracle for me to turn things around and still get the pr. I could still do it IF I didn't slow down anymore. The humidity was still stifling and I was struggling to get calories and fluids in. The stomach was just shutting down and not processing what I was putting into to it so I sat for a few minutes and tried to eat some soup before heading out on lap 6 by myself. I said goodbye and thanks to Jerry and then headed out knowing that darkness would be coming soon and hopefully cooler temps. Let me tell you. Lap 6 was awful. The breathing and spasming issues just got worse and I had mentally lost the desire to continue. The one bright spot of this lap was as I was running down the hill to the aid station on Turkey Creek in the darkness I heard the voice of a real angel, my first grand-daughter Aurora ! My son Jeremy and wife Mandy had come out with the whole family, Johnny, Nick, Aurora and Ariel to see Grandpa. Thanks to my meltdown and slow times I was about 2 hours behind what I had projected to be there so they had been waiting all that time. I sat down for about 10 minutes with them while super volunteer BD Sechler took care of getting everything I needed. I really hated to have to go but I needed to get moving so they walked with me until I disappeared onto North Turkey Creek. The rest and soup didn't help and the rest of the lap stunk and I was miserable. I debated over and over again with myself about dropping out. If I didn't have Lisa waiting to run lap 7 with me and knowing how we had planned it and looked forward to it for so long I don't know that I would have been able to face going out another lap. I finally finished lap 6 and Lisa was ready and raring to go with me. I sat long enough to eat half of a cheeseburger and while we were waiting to head out someone gave us the latest weather report. No rain expected, a cell over Greensboro so we should have a clear night. Boy howdy was that ever wrong. It was still rather warm around 11pm and I was still sweating in the thick humidity but Lisa was smart enough to convince me to let her carry a long sleeve shirt just in case. Well, we got about 3 miles out when the big thunderstorm hit. Great weather forecast. It was an impressive show for sure although never quite as exciting as the Boogie last June. It did rain very heavy for awhile and it was a cold rain but thankfully it stopped before we got to the aid station. The shirt Lisa had brought for me was soaked but I had another in my drop bag so I dried off and changed shirts and just before we headed out it began raining again. So happy we hadn't gotten out on the trail before it hit and gotten me soaked again. We got some trash bag ponchos from the volunteers and then headed out in the rain and darkness. I was still feeling like crap and still having the spasms and about to have a total meltdown on those steep North Turkey Creek hills. On the last climb I had to sit on the resting stump to let things calm down and Lisa waited patiently for me. This was not the way we had envisioned this going but Lisa is an awesome friend and an awesome pacer and her company was invaluable while I wallowed in my misery. After a few minutes it was time to move on and get back to camp. One more lap if I could just hold it together. Lisa would have loved to have gone on my last lap with me but she has Boston coming up and it was in her best interest not to go out for another lap. I sat down at the main aid station and decided to eat a hot dog before going out. This last lap was going to be special in many ways. Most importantly I would get to share it with Karla, my Marathon Princess ! I was wearing my hot pink gaiters and had gotten dozens of compliments and comments all day and into the night. Several times I was able to share the story of my reason for getting them in the first place back in 2006 and how I was going to have the honor of wearing them with Karla to finish the race . I warned her as we started out that it was going to be a long slow lap and I was going to sound like I was dying and not to worry about me. We stopped by my car so I could grab my vest because it was chilly now and I was not moving fast enough to stay warm any longer with just the shirt. Although I felt horrible and continued to have meltdowns and all the other problems it was wonderful to share it with Karla and she was great company. Slowly but surely we counted down the miles. I was hoping that the hot spots on my feet would not be a problem but halfway down powerline with 3 miles to go I felt an explosion of pain on my right forefoot that brought me to a screeching halt. In a minute the pain subsided enough that I could continue running down the hill but I was sure glad I didn't have much further to go. Just as we were about to make the final turn at the fountain to head back to the finish I saw Amy walking towards us with her husband Andy. She was in tears and my heart was breaking for her. Her feet hurt so bad but I knew she had no quit in her. I just hugged her again and mumbled something that I don't remember about getting through this last lap and then left them to put an end to my own little misery. I did surprise myself and ran up the last hill to the finish and looking at the pictures it hardly looks like I had done anything. I was of course a bit disappointed with my time but glad that I stuck with it and got another finish. I spent a few minutes talking to Joe Lugiano at the tent and then after some pictures with my angels I finally went inside the lodge to rest and eat an omelot before hitting the showers. I was shocked to find a honking big blister on my big toe and wondered how it fit in my shoe especially without popping. It supplied many moments of entertainment to friends and spectators while I waited for Amy to come in. It was a joy to finally see her come running up that last hill hand in hand with Andy. A very emotional moment for a lot of us that know her. That's it for now. I don't expect I'll be running this one again anytime soon. Next year I'll put my volunteer hat on once again and find some other Spring race to run. Wow! You, my friend, are tough as nails! Few would have continued on to the end. Great job on another 100 mile finish!! Oh Joey, I didn't realize it had been that bad. I am sorry it didn't go as planned but you are surely the most determined person I know! I know your family is super proud of you! I am proud to be called your friend and hope you are feeling back to your old self soon!! Where is this "resting stump" on Turkey Creek? Probably best I don't know about it, but just curious. Great determination, Joey! I didn't know how bad you were feeling and didn't know about the spasms - You are one tough runner! Thanks Denise. you deserve some special award for perseverance for the time you spent out there. I did read your report and your pacers. I won;t run it next year but I'll be out there volunteering and encouraging you to get that buckle.